This article is part of our series on the 2017 International Civil Society Week, where CIVICUS and the Pacific Islands Association of non-Governmental Organisations (PIANGO) brought civil society members and activists from around the world together to discuss some of the key challenges our planet is facing. You can see more of what came out of the event here. Many Zimbabweans are preparing to celebrate their first Christmas without the only president they have ever known. For some, it will indeed be a celebration, for others — particularly those in the brutal fight for real social change — it will more likely be a time for reflection and contemplation. In November, Zimbabwe’s military forced President Robert Mugabe, who had run the country since independence 37 years ago, to resign. Although the coup was widely welcomed and celebrated by citizens when it happened, representatives of civil society and the political opposition are now less enthusiastic about prospects for civil society’s role and place in a post-Mugabe Zimbabwe. And for good reason. When Mugabe’s reign came to an abrupt end on November 21, clearing the way for his former vice-president Emerson Mnagagwa to take power, expectations were high that the environment in which civil society operates in Zimbabwe would improve. But the new president’s actions, such as the appointment of a new cabinet that includes veterans of the ruling ZANU-PF party and the military who have been accused of past atrocities against civilians and activists, along with the deafening silence on any role for civil society and the militarisation of ZANU-PF, are all indications for civil society that little may change of their experiences under the new leadership. The journey for civil society over the last several decades in Zimbabwe has been a painful one. The political repression and violence against civil society we have seen in the country took a turn for the worst in 2000. The upsurge followed the emergence of the opposition Movement for Democratic Change (MDC), parliamentary elections that year and the government’s loss of a referendum on constitutional changes. At a ZANU-PF party conference at Victoria Falls in 2002, the year of presidential elections, Mugabe announced that “those who try to cause disunity among our people must watch out because death will befall them…” Indeed, the decade was characterised by violence against members of the political opposition and civil society, perpetuated by the police, intelligence units, ZANU-PF members and youth militia. The outburst of state-sponsored violence birthed other formal civil society groups who braved the onslaught and fought back. In 2003, the Women for Zimbabwe Arise (WOZA) movement progressively expanded its membership base to include 75,000 women and some men, and regularly organised peaceful protests against human rights violations while also encouraging women to stand for their rights. WOZA also organised hundreds of sessions with communities on what they would like to see in a new Zimbabwe. Others like the Zimbabwe Human Rights NGO Forum, a coalition of human rights organisations, was created in response to the violence and torture meted out to citizens and grew from 8 members to 21. Violence climaxed in March 2007 when a prayer meeting in the capital Harare, called for by the Save Zimbabwe Campaign (a coalition of church and civil society organisations) was violently repressed, under the pretext that the meeting was organised to evade a ban on political gatherings. At least one activist was killed and several others were injured when police fired live ammunition at attendees. Police have brutally repressed any protest, beating and arbitrarily detaining protesters on frivolous charges, following them up with various forms of judicial harassment. Many activists fled the country to avoid reprisals and formed civil society organisations (CSOs) abroad, to push for political reforms in Zimbabwe. Surprisingly, the regional bloc, the Southern Africa Development Community (SADC), the African Union (AU) and individual African countries failed to publicly criticise the Zimbabwean government for atrocities and violence committed against its people. In recent years, the state has not let up its attacks on civil society. As economic conditions remained dire, more brave activists have taken to the streets in protest including the firebrand Tajamuka/Sesijikile group. Police have brutally repressed any protest, beating and arbitrarily detaining protesters on frivolous charges, following them up with various forms of judicial harassment. Journalists too have faced an equally challenging environment including physical attacks from state and ZANU-PF actors. The work of activists defending LGBTIQ rights has also been extremely restricted with little tolerance for their rights. Political leaders have not been shy to threaten activists they accuse of having a regime-change agenda. During the stand-off between the military and President Mugabe that led to his historic resignation, there was reason for hope. The military allowed mass protests calling for Mugabe’s resignation, inspiring optimism for the future. A few months earlier, such demonstrations would be been violently repressed. Also, the army insisted on respecting constitutional provisions relating to the removal and appointment of presidents and Mugabe was ousted in a non-violent manner, giving hope that a new era had dawned for the country. Another glimmer of hope: a week after Mugabe’s departure, human rights activist and leader of the pro-democracy #ThisFlag movement, Evan Mawarire, was exonerated after the High Court dismissed the charge of subverting a constitutionally elected government against him. Described by international human rights group Amnesty International as “a victim of Robert Mugabe’s ruthless campaign to criminalise dissent,” Mawarire had been on trial since February 2017 for calling for mass protests against corruption and the socio-economic challenges. 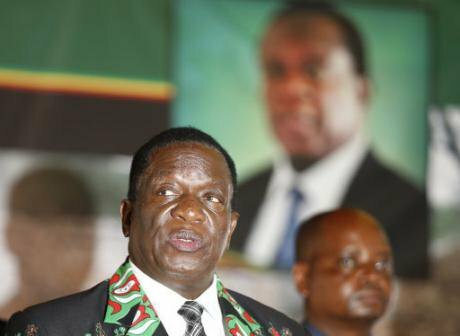 Mnangagwa has done little so far to open up spaces for the participation of civil society and the political opposition ahead of the elections in 2018. This ruling is a test of judicial independence in a post-Mugabe Zimbabwe — an independence that should be developed by the judiciary and civil society, to bring about a new respect for the rule of law, equally applied by all. The momentum from this judgement should be sustained by the release of all human rights defenders and political activists currently in detention and by cases against them and others being dropped. However, these glimmers of hope are clouded by other worrying signs. Since taking over, President Mnangagwa has focused on strengthening the role of the military in power structures, appointing military men to the party and senior roles in government. He has done little so far to open up spaces for the participation of civil society and the political opposition ahead of the elections in 2018. There is concern around whether CSOs will be able to participate freely in electoral processes before, during and after the upcoming polls and whether military decisions dictate the politics. Even though the crackdown on civil society over the last decade forced some human rights defenders and representatives of civil society to self-censor to avoid reprisals, many CSOs braved repression to continue to call for reforms, demonstrate against the regime’s human rights violations of the regime and act in solidarity with victims of violations. The fast approaching election brings opportunities while many old challenges remain. Zimbabwean civil society must now re-invent itself to reclaim and maintain spaces that these opportunities present to enable them address challenges in a post-Mugabe Zimbabwe. Much work remains to be done in aligning laws to the new Constitution, electoral reforms are still incomplete and the ability of the state to allow for an environment that will enable free and fair elections has to be demanded. But by creating the synergies between the formal civil society groups working on governance, democracy, human rights, social and economic development, gender and women’s rights, and the social movements and individual activists who have shown their power in mobilising citizens, there is a path away from the Mugabe era.